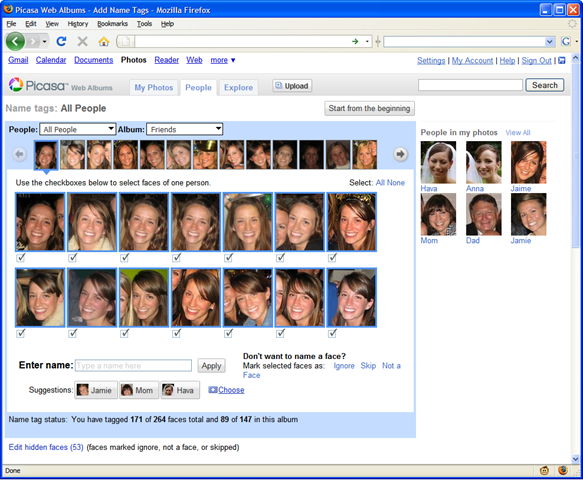 While we were waiting for Microsoft to release an updated version of Windows Live Gallery with facial recognition support, CNET just broke the news that Google had already added facial matching features in their own Picasa Web Albums website. Google will also release Picasa 3 for Windows desktop sometime later today that includes a new movie maker mode to help you make moving video clips out of your still photographs. "It took me less than 15 minutes to tag close to 200 faces in a set of more than 100 photos, and that included some start-up time such as figuring out how the system worked, establishing names for various common subjects, and correcting a few errors. The most impressive moments are when Picasa presents a large array of photos with the same face, and you can label them all with a single click. "